Take this cute and cuddly Dudley Dragon soft toy for a walk in the fearsome forest, or curl up with him for a safe and snuggly snooze. Dudley has beautifully vibrant green coloured fur, a luscious and thick mane and the most comfy fur for a cosy cuddle whether on the sofa or at night time in bed. 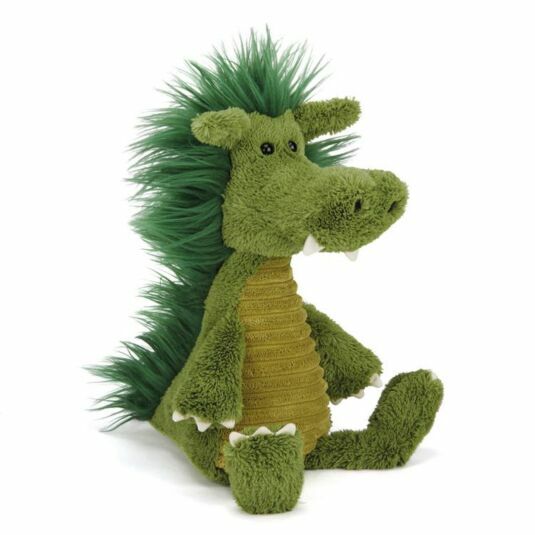 This Dudley Dragon also has plastic beans in his bottom, meaning he can sit up on his own on a shelf or bedside table. Jellycat themselves give specific care instructions for all their products: Lots of love. How can you resist? ?